Chase, Bank of America, and USAA are the top mobile banking providers equipped to deal with rising expectations from consumers, according to a new report from Javelin Strategy and Research. Javelin Strategy & Research’s latest report evaluates the 25 leading U.S. retail financial institutions (FIs) mobile banking offerings by comparing features, mobile access, app, Web and text banking, and mobile alerts. 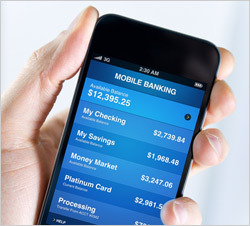 Mobile banking is on the rise -- now used by 33% of mobile consumers, up from 24% in 2011. Of the top 25 U.S. financial institutions by deposit, about half are offering mobile person-to-person (P2P) transfers and mobile remote deposit capabilities, a figure that has more than doubled since 2011. Javelin awarded best-in-class to Chase for the second year in a row, citing such advanced offerings as P2P transfers, mobile deposit, and near real-time, actionable alerts. Bank of America came in at second place and scored highest for providing the widest mobile accessibility both through device and mode. USAA, a perennial mobile banking powerhouse, placed third. Financial institutions can use the benchmarks in the report to evaluate themselves against top performers, identify specific areas for improvement, and bring their mobile banking offerings up to speed. One area of concern is that the number of consumers reporting problems accessing mobile banking services at their bank has more than tripled since 2009 from 4% to over 14% in 2012. Without access there is no mobile banking. One of the most difficult issues facing mobile banking today is providing access to the multiplicity of devices that customers use. The report “2012 Mobile Banking Financial Institution Scorecard: Three Keys to Mobile Money Movement Success,” benchmarks the mobile banking service offerings of the 25 largest U.S. banks by deposit, highlighting areas of growth and areas where banks are falling short. The 59-page report includes ratings and comparisons for each financial institution and over 1,200 data points.